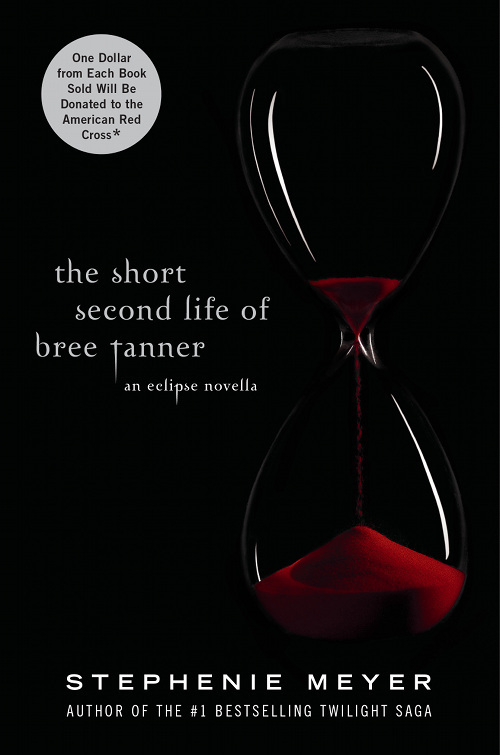 The Short Second Life Of Bree Tanner is a spin-off novella of Stephenie Meyer’s novel Eclipse. You can order your copy of the book here at Amazon.com. The book will also be available for free as a download from June 7 through July 5. Read more about The Short Second Life of Bree Tanner on Stephenie Meyer’s site. why stephenie meyer dont make a book about alice’s life ?? why not about jaspers life??? why not about their life before bella came??? How bout she just finishes Midnight Sun, then make a book abotu Alice and Jasper’s life. i agree too. She should finish this first. I wish there was a book about Alice too. Her and Jasper are my favorite! they made one on bree why not alice? Alice is awesome, and it would be cool if Stephenie did a book about her, but I like the fact there is always mystery about her. You are right, Alice is the greatest and most awesome…I even got a haircut like her’s! I’m totally with you, I love Alice!! She ROCKS!!!!!!! We should gather people and make a request about it! nooooooooooooooooooooooo!!!!!!!!!!!!!!!!!!!!!!!!! ALICE IS SO MUCH BETTER YOU GO ASHLEY SWEETHEART!!!!!!!!!!!!!!!!!!!!!!!!!!!! I think she should write books about all the Cullen’s lives. That would be so cool and I know I would like to know more about Jasper, Emmett, Alice, and Carlisle. I read the short second life of bree tanner in the parking lot of barnes and noble as soon as I bought it!!! Mall cops finally came up and knocked on my window just as I was wrapping up asking what I was doing and then laughed because I could not wait until I got home! It was good but not quite what I expected…how exciting to read another perspective! i think, since stephanie has a little bit of free time, she should write a backstory for all of the cullens. she has written a very small amount about them in the previous 4 books, but it would be fantastic if she wrote more about them, for the fans who would love to have a bit of everyones story. i sure would! I just finished Bree Tanner…It was so great to see the other side of what was going on in Seattle. I think the most intriguing part of the book was that the Volturi were in cahoots with Victorian and Riley and Bree was able to tell Edward this (through her thoughts of course) before she was killed, and that Edward secretly knows this and carries this with him the entire rest of the series, or at least he never tells Bella….Oh, I so badly want to hear the story from Edward’s point of view!!!!!!! I can’t wait till Kallie and Kassie discuss this in one of thier podcasts! think stephane should write another book about bella, edward, jacob and reneesme moving away, bella going to dartmouth and seing how bellla continues her journey as a newborn vampire. shes coped well till now cos she has only been around her father. it would be interesting to see how he manages around a whole campus of humans. it woud be also interesting to see how reneesme and jacob relationship develops and how her parents cope with it. If you think bout it making a book bout alice and her expierence would be great…but i would reccomend people to read the short second life of bree first…i personnally loved it and think that it is very sad what happened to her…..and yes they should right another book aboutwhat happened to the cullens…other than thaat great job stephanie!!! You guy’s are soo lucky! I haven’t got the chance of reading her new book. It have been a strike here in Norway, and the books haven’t been ported here yet… I want to read the book soo much! If Stephenie are gonna write all these books, it wouldn’t be any mystery left, you know..
Bree’s book is great! but i think that Stephanie should finish Midnight Sun! I can’t wait!! I’m still waiting for Twilight from Edwards perspective! Why did Stephenie Meyer write a book about Bree Taner I mean that character is so boring is so boring. Stephenie Meyer should finish Midnight Sun First. Then write a story about The Cullens life before they were vampires. well in my part I really want a book about Alice and Jasper they both have me hook there is something special rimantic and dark about them I know the series of books and movies are about bella and edward but in Eclipse I felt head over hills for this two characters hopefully they get a book or short story anything they are great…..
Log in | 60 queries. 1.042 seconds.